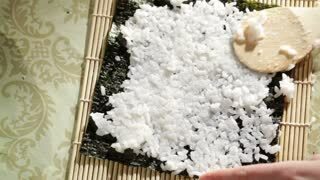 Putting rice on nori. 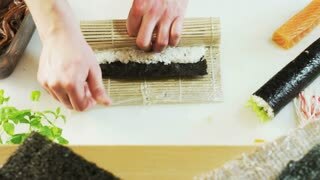 Making sushi rolls. High angle view. 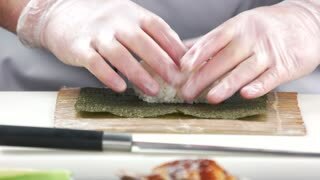 Hands of cook make sushi. Man putting meat onto rice. Traditional recipe of japanese rolls. Fresh pineapple bits. 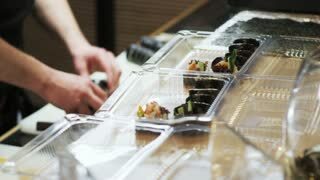 Hands making sushi close up. Nori and rice. 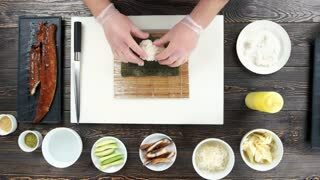 Chef making unagi sushi roll. Nori, rice and smoked eel. 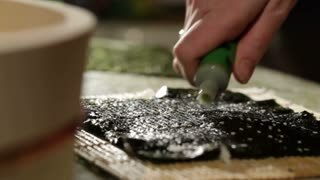 Sushi preparation, rice and nori. Hands making food top view.